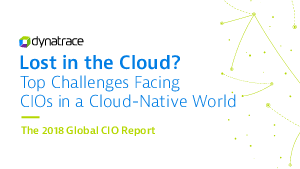 Based on a global survey of 800 CIOs, this report examines the challenges organizations face when working within complex, cloud-centric ecosystems. Technology is at the heart of every organization today. Now more than ever, society expects the services we use to be innovative and faultless, prompting the creation of hyper-complex IT ecosystems. Relying on physical databases and third-party cloud service providers, businesses are finding it increasingly difficult to monitor application performance, ensure positive experiences, and succeed in this new environment.